Try These Proven Fruit Masks. There is nothing wrong with living in the skin you feel comfortable in. Most chemical skin bleaching creams are not only dangerous and can cause diseases but also illegal in Kenya. These commonly Chinese skin whitening products contain mercury or hydroquinone, dangerous chemicals that can even cause nerve damage. That aside, lighter skin complexion is achievable without using bleaching creams sold illegally in Kenya from China. Buyer beware. In this article, I am going to share safe ways of lightening your skin without bleaching chemicals. The Glutathione Way. Of course, you are not going to change your natural black colour to a Caucasian white face. That is unrealistic. I am not telling you to do the Michael Jackson thing. I will start with one of the most effective and I would say my favourite of all the natural skin lightening homemade recipes. Sandalwood is mainly native in India, Sri-Lanka, and parts of Australia. It is a rare, overexploited plant with many medicinal and cosmetic value. Sandalwood oil is among the most expensive essential oils in the market today. Sandalwood not only lightens skin but it also treats acne, reduces scars and sunburn. Turmeric is another miracle spice native in India and parts of southern Asia countries. Turmeric, as you may already know, is a miracle weight loss supplement especially belly fat and controlling appetite. Having turmeric in your home will prove to be a very wise move but make sure you only use organic turmeric on your skin. Add two tablespoons of sandalwood powder, a teaspoon of turmeric powder and some milk in a bowl. Add in the milk to the dry ingredients until a thick paste is formed. This should be like porridge consistency or lotion consistency. First, exfoliate your skin to allow maximum absorption of these organic ingredients. To exfoliate, add a tea spoonful of Moroccan Argan oil to brown sugar and scrub your face, your neck, behind the ears and your hands. Rinse with water and pat dry. You can repeat as many times as you want until you achieve clear smooth skin. Later, apply your skin lightening mask on your face and leave it on for about 20 -30 minutes before rinsing off. These ingredients are some well-known natural whitening agents and they remove impurities from skin effectively. Repeat this about 2-3 times a week and you will start noticing a much brighter, lighter smooth face. As an added benefit, you will also notice acne will disappear especially because of Moroccan Argan Oil, Turmeric & Sandalwood. You already know how delicious a pawpaw is. Eating pawpaw daily can actually make your skin lighter and brighter – NOT BLEACHED. If you are allergic to pawpaw white exudation, only use over ripened pawpaw. Please note you can combine more than one fruit mentioned here to come up with your own skin whitening mask. Crush ripe pawpaw and add a teaspoon of lemon juice. Using a blender or whichever method you have available, mix it to form a yogurt-like consistency face mask. Apply the pawpaw face lightening mask you just made and let it stay for 20-30 minutes. Rinse your skin thoroughly with a non-soap facial cleanser like Safe Choice Organic Chamomile Cleanser. You will notice your skin will instantly feel softer, look tighter and brighter. Repeat this twice a week and you will notice a significant difference. For even better results, apply this mask at night before bed time. Once you have rinsed out the mask on the last step above, apply Vitamin C facial serum and let it stay overnight. So, why does pawpaw mask work so perfectly? Pawpaw contains an enzyme called papain. Vitamin C is the most important ingredient of collagen, the substance that binds cells together. Stable collagen production fights wrinkles and ensures evenness in the skin’s tone and texture. HINT: Taking collagen peptides supplement can make your skin look 5-10 years younger in just 2 weeks. You should try it. Sun rays in Kenya and countries close to the equator is believed to have stronger UV rays that further damage the skin. 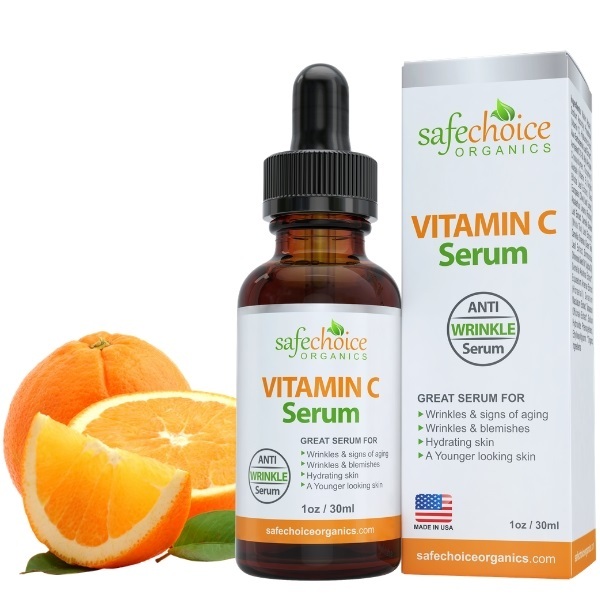 Vitamin C serum function as an antioxidant also benefits the skin, as it is able to protect the skin from damaging free radicals. Put orange peels under the sun until they are dry and crispy. Please note that while orange is rich in Vitamin C, Dried orange peels do not have vitamin C. Vitamin C is volatile and is destroyed by the sun. It is better to follow up every procedure with Vitamin C serum to help repair your skin, remove wrinkles, lighten and brighten your skin. Mix the powder with raw unprocessed yogurt. For better results, ferment your own milk as popularly known in Kenya – Maziwa lala. Do not use commercially bought pasteurized milk or processed yogurt, unless you cannot find Maziwa lala. If you use commercially processed yogurt, avoid yogurts with additives like probiotics. Exfoliate your skin as above using brown sugar and Organic Moroccan Argan oil and pat the skin to dry. Apply the face brightening mask and let it dwell for 20-30 minutes then rinse with warm water. Repeat this mask two to three times a week for best results. Apply Vitamin C Serum and let it stay overnight. You’ll be amazed how smooth, even , brighter and lighter your skin will become. You will notice that some of the most highly recognized cosmetic brands like Aveeno heavily use oatmeal. In fact, oatmeal is not only good for your skin but also great food for reducing cholesterol due to high fiber content. Smash a ripe tomato and mix it with Yogurt and oatmeal. Stir it until you get a pasty mask. It is better to have ground oatmeal into a powder form. Apply the mask on your exfoliated face using Organic Moroccan Argan oil and raw brown sugar. Let it stay for 20-30 minutes and repeat as necessary. Once the skin is rinsed, always follow with Vitamin C serum for best results. This could be the most effective face lightening homemade masks that you can get your hands on in Kenya. A picture is worth a thousand words. The above picture says it all. Mix gram flour, honey turmeric and milk in equal portions to form a yogurt-like paste and play it to your skin. Allow it to dwell for about 45 minutes before rinsing it out and applying vitamin C serum. Potato juice offers a variety of benefits for the skin. It whitens and moisturizes the skin, removes impurities, and eliminates dark circles and eye bags when applied under eyes. Crush and grind raw potatoes to form a smooth porridge-like paste and apply on an exfoliated skin with raw brown sugar and Moroccan Argan oil. Repeat this several times a week and apply Vitamin C Serum each and every time after rinsing the mask. It is even better to apply each mask type each day. The reason being, each of the said natural organic ingredient has different nutrients that brightens the skin. Example, Pawpaw has Papain enzyme known to brighten the skin naturally without bleaching. Yogurt has lactic acid an organic non-harmful product that naturally smoothes and brightens the skin without dangerous chemicals. But it is even more effective, natural, harmless and with natural cellular immune benefits when you mix the masks above with Vitamin C serum and L-Glutathione Supplements. Skin Whitening Glutathione – How to use Glutathione to lighten your skin. Glutathione increases cellular metabolism and increases disease-fighting properties of your body. This is why glutathione supplements are recommended to patients with cellular destructive diseases like cancer, chemotherapy, burns, etc. Glutathione protects your body from damages caused by heavy metals like Mercury – commonly used in skin bleaching products sold in Kenya illegally. Glutathione increases cognitive function and alertness. This is because it is capable of permeating through blood-brain barrier causing antioxidation and detoxification of the brain and the nervous system. This explains why Glutathione is even used to treat depression and other neural system diseases. How to Whiten Your Skin using L- Glutathione pills. A few things before I get into the skin lightening recipe with L-Glutathione. Glutathione is very poorly absorbed in the stomach and it is rapidly damaged by stomach acid. Taking just any commercially sold L-Glutathione may not have any effect due to this reason. To achieve Skin whitening therapeutic dose of L-Glutathione, You MUST take 20-40mg per KG of body weight in 2-3 doses daily. Meaning if you weigh 60kg, you must take 1200mg – 2400mg daily divided into 2-3 doses. Something like 2 500mg caps twice in the morning. Take enough vitamin C to allow better absorption of Reduced glutathione. Always use a good sunscreen to protect your skin from sun damage. There is no need to go for any sunscreen above 45spf. That is all you need. Be realistic with your expectations. You will never look Caucasian if your skin is naturally black but you can brighten and lighten your skin without bleaching. Your skin renews every 15-30 day, meaning, using these homemade recipes regularly is a good idea. If you stop feeding your skin with these natural foods instead of chemicals, you might have to feed it with chemicals as food. Avoid chemical bleaching skin whitening products. Hi thanks for the article. It’s very enlightening. Can I get glutathione reduced with vitamin c? Hi i have been looking for what to lighten my skin with i have not been able to find. How can i get the gluthanine and vitamin c serum. Secondly how fast should i expect results. And how much are the products can they be found in shops. How much is the reduced L glutathione ? Thanks for that advice. I will try.